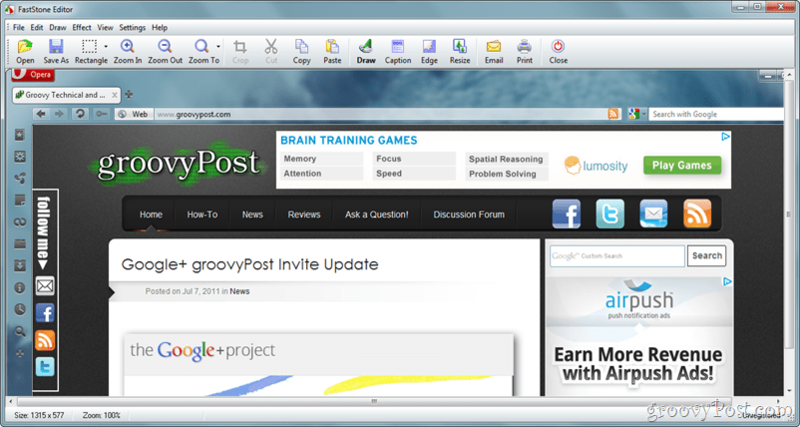 If screenshots are a vital part of your everyday computer-oriented life, then you would have definitely seen one of our reviews on TechSmith SnagIt. As good as the software can be, there’s still the problem of making screenshots on the go, which is sometimes necessary. So today we’ll review a great application called FastStone Portable Screen Capture, which will hopefully free you of any worries about taking screenshots on the go. As always, freewares has a lot of priority here at groovyPost, and we’re happy to tell you that this application is completely free of charge. All you need to do is download it from this link, unzip, and then place all the files into a separate folder on your flash drive. The user interface of FastStone is very simple. Yes, we mean really really easy to use. That little window you see in the screenshot below is the whole program. From left to right you have buttons for different types of capture, as well as some additional capturing features; we will talk about later. Even though the program does its job, some more visuals wouldn’t have hurt, so this category gets 4 stars from us. The possibilities of this application get more and more expansive the more you browse around. There are useful features like running at startup (for non-portable usage), capture delay, and extras like a screen magnifier and a screen color picker (all very similar to SnagIt). 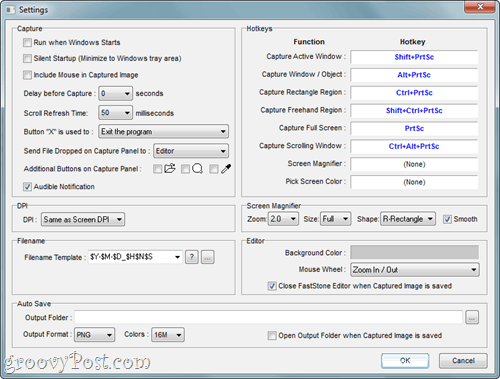 Of course the best part of the settings, as you can probably see for yourself is the Hotkeys section – you are allowed to choose different keyboard shortcuts for every capture mode and also for extras like the screen color picker and magnifier. For a free piece of software, we believe that’s more than enough – 5 stars it is then. 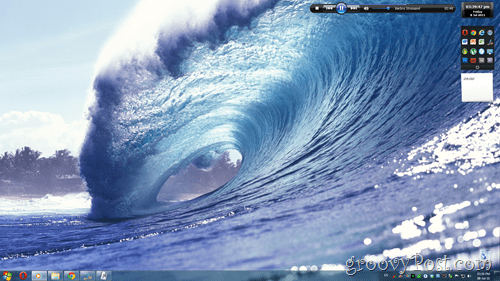 Here’s what a quick screenshot of my desktop using FastStone. The images come out nice and sharp and are exactly what you’d expect from a screenshot program. Not much to say here, and, again, one more category nailing 5 stars. 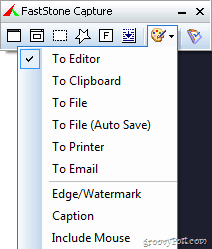 At first glance, the two more unusual and unique capture options are To Printer and To Email. As impressive as those features can be, they seem to be the only ones which cause a lag about 2 seconds. We tried the program on several different computers and the more we tried, the weirder it got – on some more powerful machines, the Printer option actually seemed to lag more than on the weaker machines, which is a bit confusing, but understandable, since we are running the entire program from a thumb drive, after all. The other three features also work pretty well, except the Edge/Watermark feature which seemed to crash the program when ran from a thumb drive. As you can see, the capture extras come bundled a few issues that annoy, but nevertheless are still quite good for a free piece of software. When taking screenshots, by default they are imported into the built in image editor. The editor allows you to do some basic edits before exporting your image, such as drawing on top of it, marking a key area, and also adding text. The truth, however, is that even minimalistic edits like the ones you see below lag too much when Anti-Aliasing is turned on (bottom right checkbox next to the OK button) and look to choppy if Anti-Alias is off. 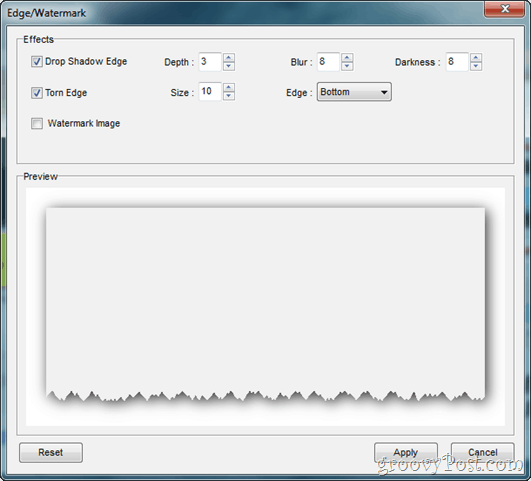 Remember the crashing Edge/Watermark feature from the Capture Extras? Well, believe it or not, it works just fine in the image editor. As good as that is, it turns out that the Watermark can only be an image, and does not support using a plain text input and custom font. The torn edge effect is useful, and drop shadow also works pretty well for giving a more professional look to your screenshots. Overall, it’s a good addition to the editor, but a bit disappointing as well. Exporting is surely one of the most vital parts of making a good screenshot “come to life”. And with the advanced feature of the FastStone Editor exporting program we have absolutely nothing to complain about – you’ve got everything – from a quick before & after peek to an advanced format selection and a wide range of compression levels this is the ultimate geek heaven – even just knowing you can make your image anywhere from 100 kilobytes to 6 megabytes and beyond, really comforts you and lets you know you’ve got the power in your hands. In the end, even though a bit limited and not fully usable, the editor delivers some nice and easy to use extra features for you to use and has some great tools to help customize your image. Most of all, having in mind that you’ve got way more than you need in terms of saving and exporting, it is safe to say we can give the editor a clean 5 out of 5. FastStone Capture is a great free screenshot application, perfect for taking basic screenshots on the go. Even though we got to see some cool geeky additional features on display, we weren’t exactly impressed, and there are some parts of the program that need just a little bit more to reach perfection. Despite some letdowns here and there, FastStone is still a great solution for quick shots on the go and for easy organization of screenshots between a home and an office computer, for example. Despite all we’ve said, we should again remind you FastStone is a freeware application, and for a free app it undoubtedly does its job very well. 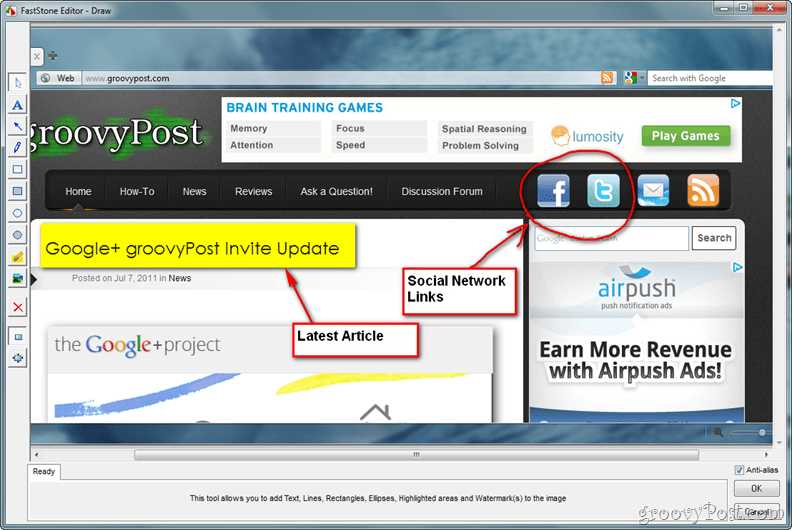 I’ve been using FastStone Portable Screen Capture for a long time now. I must portable apps for everything and this is by far the best screen capture tool I’ve found. Since I do a lot of pictorial tutorials for gpEasy CMS on my site I needed a flexible and handy screen capture tool. . .and this is it. One tip I would recommend to everyone is, set the screen capture to 256 color especially if the images are going on the web. 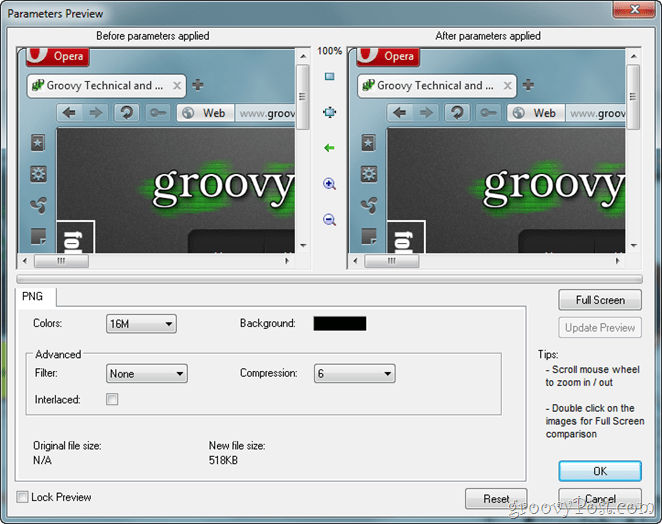 It will greatly reduce the size of the images. Great write up on a great tool!